Strong feet and ankles will improve your performance and protect you from injury. As a dancer, you likely hear your peers either gloating or whining about how their feet look when they point. 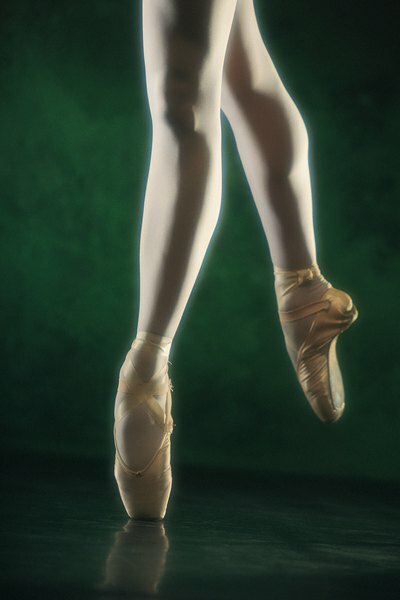 Some dancers are blessed with high arches and beautifully curved feet, and others just aren’t. Whatever type of foot you have, you'll do yourself a favor by focusing more on foot, arch and ankle strength and less on aesthetics. Whether you’re posing, turning, jumping, beating or brushing, you're counting on a vast network of foot and ankle muscles to support you and keep you injury-free. Warm up your feet and ankles by prancing lightly around the room for five to 10 minutes. Articulate through all the parts of your foot, including your ankles, metatarsals and toes. Hold onto a ballet barre or sit in a chair and complete 10 to 20 slow ankle circles in both directions, using your right and then your left foot. At this point, your feet and ankles should be ready for more intense activity. Sit on the floor with your legs extended in front of you and your feet flexed. Loop the middle of a resistance band around the ball of your right foot, pulling back on the ends of the band to remove slack. Straighten your spine and slowly extend the toes of your right foot away from your torso, articulating through the foot until the foot is fully pointed. Return the foot slowly to a flexed position and then repeat the exercise 10 to 15 times for a total of one to three sets. Switch to your left foot. Remain seated on the floor and tie the ends of the band around a stationary object -- such as the leg of a couch -- directly in front of you. Loop the band around the instep of your right foot, extend your legs and slide your buttocks backward until the band is taut. Straighten your spine and slowly flex the toes of your right foot toward your torso, working against the band's resistance. Hold the flexed position for several seconds and then relax the foot briefly. Repeat the exercise 10 to 15 times for a total of one to three sets and then switch to your left foot. Sit on a chair with your feet flat on the floor in front you. 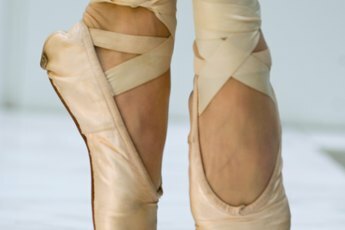 Gently, slowly draw the toes of your right foot toward your right heel, creating a “dome” with the foot. Keep the toes long and flat against the floor rather than curling them under. Hold briefly and then slide the toes back to their initial position. Repeat the doming exercise 10 to 15 times for a total of one to three sets. Switch to your left foot. Sit on the floor with a large bath towel spread out in front of you. Sit tall, bend your knees toward the ceiling and place the soles of your feet on the towel. Keeping your thighs close to your body and pressing your heels into the floor, raise your toes and then the balls of your feet off the towel. Open your feet into turned-out first position; lower the balls of your feet and then your toes. Grab the towel with your toes and close your feet into parallel first position, drawing the towel inward. Repeat the sequence 10 to 15 times for a total of one to three sets. After your foot and ankle workout, roll each foot over a tennis ball or frozen water bottle to relieve tension. Pain or swelling in the foot or ankle are indications of injury. If you have such symptoms when dancing or exercising, stop immediately and contact a doctor. If you've injured your foot or ankle in the past, talk to your doctor or physical therapist about the advisability of specific exercises.